Maharaja Damaji Rao Gaekwad, also known as Damaji II, was the third son of Pilaji Rao Gaekwad. After coming to the power, he wanted to take revenge for murder of his father & also had to re-capture Baroda, lost by his father. He took all sort of help from his brothers & relatives. In 1734, he recovered Baroda from Sher Khan Babi, who was the then Governor of Baroda State. 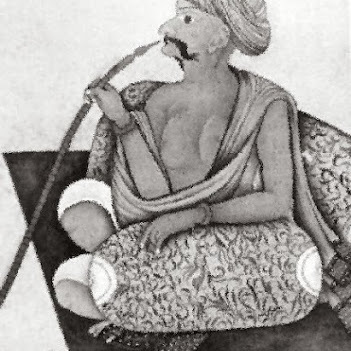 In 1737, Momin Khan was appointed as Viceory of Gujarat. Damajirao & Momin made joint efforts & captured Ahmedabad in 1738. There is also a Samadhi near Savli, where it is popularly known as ‘Damaji no Dero’, along side the Samadhi of Pilaji Rao Gaekwad ! He died at Patan on 18 August 1768. The death of Damajirao at this particular juncture was most unfortunate for the Gaekwads, because several sons disputed for the Gadi. Sayajirao, the eldest son, was born to Damajirao by his second wife Kashibai while the second son, Govindrao, who was in confinement at Poona, was his offspring by his first wife Manubai. Besides these two sons, four other sons namely Fatehsinh, Pilaji, Manaji and Murarrao were born to his third wife Gangabai. In this way the quarrel for the succession that arose on Damajirao’s death was the first step towards the breaking up of the Gaekwad power.